DOTSOGRAPHY! The new interactive Dotsography is now online. The files now include images, so they will take a bit longer to load than the older versions you've seen on this site for these past few years. Remember that The Dotsography is a constant work in progress. I will be making minor changes and additions to the new files over the next couple of weeks. Thanks to Jon Whitney for all his help and guidance with the new files! NEW MP3: There is a new MP3 online at the Downloads page. It's a great version of "Window On The World" and it was recorded in Denver, CO on November 9, 2002. Enjoy! We have updated the Photo Gallery. The Legendary Pink Dots show scheduled for 11/25/03 at Kazanhaz in Debrecen, Hungary has been rescheduled. The show will still take place at Kazanhaz but it will be on 11/30/03. The Legendary Pink Dots show scheduled for December 27 at the Gagarin 205 Club in Athens, Greece has been postponed until mid-April 2004. We will keep you updated as new details emerge. We have updated the Cast of Characters. 9 LIVES TO WONDER: Flesh Eating Ants is now taking pre-orders for the long-awaited 2 X LP edition of "9 Lives To Wonder." According to FEA Headquarters, "The release will be issued on 220 gram, coloured audiophile vinyl, and housed in a stunning full colour gatefold sleeve. The sleeve brings the original artwork to a significantly larger size, with a large portion of the text on CD versions left off, fully showing off the beauty of the original piece. This release will also include a colour insert of artwork and lyrics. Parts of this album have been slightly re-worked by Edward Ka-Spel. There is also an entire side of newly-recorded, exclusive, bonus material." For more information on "9 Lives To Wonder" and to hear MP3 snippets of the bonus track "The Uncanny 18th Shade," click here. You can also still place pre-orders for this release through TeKa. ALL THE KING'S HORSES: The gorgeous 2 X LP edition of "All The King's Horses" is now in stock at both Terminal Kaleidoscope and Soleilmoon. It includes all music from last year's CD edition, a lyric sheet, and a splendid bonus track entitled The Emergency Exit. PRAYER FOR ARADIA: Big Blue is re-releasing the much sought-after "Prayer for Aradia" CD in the very near future. You may pre-order this release from TeKa. Those of you who own Edward Ka-Spel's lyric book Love and Loud Colours and those of you who subscribe to the Legendary Pink Newsletter will instantly recognize the artwork of Pieter Schoolwerth just below this paragraph. 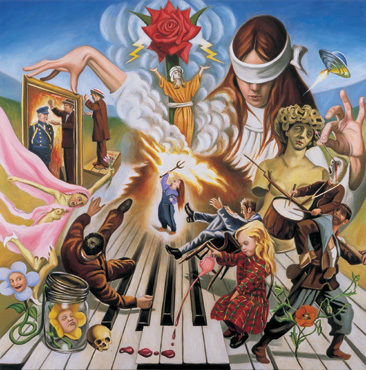 Pieter is the extraordinary artist whose fantastic visions graced the cover of the 090301 CD which was included in all copies of Edward's lyric book - and his art is also prominently featured in the September 2003 issue of the Legendary Pink Newsletter. If you happen to be in New York City this fall, you can see Pieter's work for yourself at The Elizabeth Dee Gallery, which is located at 545 West 20th Street. The exhibit opening is on Saturday, November 15 from 6:00 to 8:00 p.m.
You can learn more about Pieter and see more of his artwork by subscribing to the Legendary Pink Newsletter or clicking here. The Legendary Pink Dots show on 29 November in Brezno, Slovakia will take place at Bombura. The Legendary Pink Dots will not allow audience members to film any of the shows on their upcoming European tour. Thank you for understanding. NOTE TO THOSE WHO PURCHASED THE EXCLUSIVE TOUR CDR ("AN UNLIKELY EVENT") AT EDWARD KA-SPEL'S SOLO SHOWS: If you purchased the exclusive tour CDR at one of Edward's US shows and you find your disc to be defective, please contact me with your full name and mailing address and the nature of the defect. I will forward your information to Raymond Steeg and he will replace your disc as soon as he can. Many thanks to all of you for your support at the solo shows and we hope you had as much fun as we did! Alright. Bags are packed, contracts in place, work visas taken care of. We are ready to embark on Edward Ka-Spel's North American solo adventure! Also, if any of you run across write-ups or reviews of the shows online, please be kind enough to send me the links. Thank you so much for your help and we'll see you on the road! Coven of One will be opening Edward Ka-Spel's shows in Washington DC, Denver, CO (along with locals Orbit Service), Phoenix, AZ, Los Angeles, CA, San Francisco, CA, Portland, OR, and Seattle, WA (along with Beta-lactam Ring recording artist Bill Horist). Here is the current schedule for Edward's North American tour. All shows are now 100% confirmed. Edward will be joined onstage at all performances by The Silverman and Nicoletta Stephanz (Coven of One), Raymond Steeg will provide sound and the merchandise booths will be manned by me (Lisa), so please do come check out all the new releases and say hello! We will add more dates as they are confirmed, so please keep checking back! EDWARD KA-SPEL CAMBRIDGE, MA SHOW MOVED: Edward Ka-Spel's show in Cambridge, MA has been moved to The Middle East Club. The show will still take place on September 28. Edward Ka-Spel is scheduled to appear on Greg Clow's radio show Feedback Monitor on Tuesday, September 23rd at 11:00 p.m. Eastern Standard Time. Feedback Monitor has been a weekly radio show on CIUT Radio in Toronto since February, 1996. It can currently be heard on Tuesdays from 10:00 p.m. until 12 midnight at 89.5 FM in Toronto and surrounding areas. Worldwide, you can click here to listen via RealAudio. Things are rapidly falling into place for Edward Ka-Spel's North American tour which begins in just over two weeks! We are picking up a show in LaCrosse, WI at The Warehouse on October 5 and we are also working with our wonderful promoters in Boston to move the Edward Ka-Spel/Dresden Dolls show that was scheduled for September 28 at The House of Blues to another venue as The House of Blues is closing on September 14. I will post an updated schedule as soon as we know more. James Bergman, Nick Bonse, Das, Randall Frazier, General Chaos Visuals, Corey Goldberg, Isabelle Hebert, Rachael Jackson, Eric Lanzillotta, Eileen Lawlor, Brad Lynham, Jami Maselli, Chris McBeth, Jeff Morey, Kirsten Janene-Nelson, Paul Newman, Bert Nijmeijer, Ninah Pixie, Vik Pahwa, Amanda Palmer, Poppy Kimono, Charles Powne, Lisette Sutherland, Danelle Tavares, Jon Whitney, Kent Wilhelmi. Thank you all SO MUCH for the help and support you have given us over the past several weeks!!! We have added a new tour date at Burt's Tiki Lounge in Albuquerque, New Mexico on October 8th. LEGENDARY PINK NEWSLETTER UPDATE: Those of you who subscribe to The Legendary Pink Newsletter will be happy to know that a new edition is in the works and should be winging its way to in-boxes all over the world within the next 2 weeks. There is a lot going on at Chez Dots these days, so it will be a very informative issue! If you would like to subscribe to the newsletter, please click here and choose "Subscribe To The LPD Newsletter" from the drop-down menu. 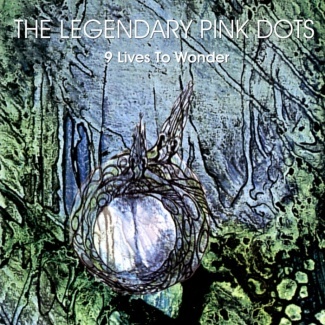 THE LEGENDARY PINK DOTS: 9 LIVES TO WONDER (Flesh Eating Ants) - 2 x LP with bonus 4th side. Please note that while you may pre-order this item through TeKa effective immediately, Flesh Eating Ants is not taking advance orders at this time. When pre-orders are available through Flesh Eating Ants, details will be posted on their website. TeKa Price: 25 Euros/25 USD. THE LEGENDARY PINK DOTS: ALL THE KING'S HORSES (Soleilmoon) - 2 x LP with bonus 4th side. Please note that while you may pre-order this item through TeKa effective immediately, Soleilmoon does not accept advance orders. When this item is available for purchase through Soleilmoon, details will be posted on their website. TeKa Price: 25 Euros/25 USD. 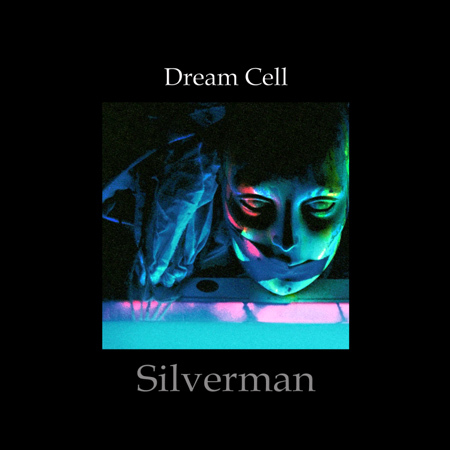 THE SILVERMAN: DREAM CELL (TeKa/BLRR) - 2 x LP with bonus material. Fans in Europe may pre-order this release through TeKa and fans in North America may pre-order through Beta-lactam Ring Records. Scroll down for more information on this release. Price: 25 Euros/25 USD. 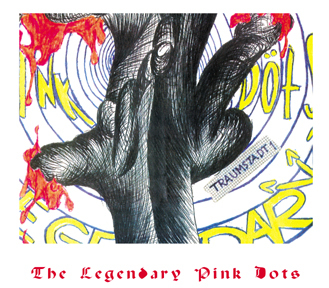 THE LEGENDARY PINK DOTS: TRAUMSTADT ONE (TeKa/BLRR) - CD compiling the "Apparition" and "Atomic Roses" cassette releases. Fans in Europe may pre-order this release through TeKa and fans in North America may pre-order through Beta-lactam Ring Records. Scroll down for more information on this release. Price: 20 Euros/22 USD. A GUIDE TO THE LEGENDARY PINK DOTS (Big Blue) - 2 x CD featuring lots of unreleased live material. TeKa Price: 23 Euros/25 USD. THE LEGENDARY PINK DOTS: PRAYER FOR ARADIA (Big Blue) - Reissue of highly sought-after 1996 LPD release. TeKa Price: 20 Euros/22 USD. THE LEGENDARY PINK DOTS: I DID NOT INHALE (Zakat) - Russian CD release to coincide with shows in Moscow and St. Petersburg. All tracks have been previously released, but stock is very limited. Scroll down for more information on this release. TeKa Price: 20 Euros/22 USD. EDWARD KA-SPEL: SING WHILE YOU MAY T-SHIRT - Olive green tailored shirt. TeKa Price: 20 Euros/22 USD (All sizes). THE LEGENDARY PINK DOTS: LET LIVE T-SHIRT - Re-printed. TeKa Price: 20 Euros/22 USD (All sizes). To pre-order any of the new merchandise from TeKa, click here and choose "Pre-Order" from the drop-down menu. 8/26/03: JUST IN TIME FOR THE RUSSIAN SHOWS: NEW RUSSIAN COMPILATION CD! Russian label Zakat has just released a Legendary Pink Dots compilation called "I Did Not Inhale." The CD should be available at both shows in Russia this week (August 28 - Moscow - B2 Club and August 30 - St. Petersburg - Red Club). Beta-lactam Ring Records has sent over the finished cover art for the upcoming "Traumstadt One" CD. This disc is a composite of two early Legendary Pink Dots cassette-only releases - "Apparition" and "Atomic Roses" - and is slated for an early September release. We have added a new tour date at The Black Cat in Washington, DC on September 29th. We are pleased to announce that once again, the kind folks at General Chaos Visuals will provide their fantastic visual effects for Edward Ka-Spel's solo show at Lee's Palace in Toronto on September 24th. Those of you who attended the Legendary Pink Dots show in Toronto last year will certainly remember the dazzling psychedelic light display! ABSOLUTELY NO SOUNDBOARD OR VIDEO RECORDINGS WILL BE PERMITTED ON EDWARD'S SOLO TOUR. Snapshots are fine but please, no flash photography. Edward has no problem with audience sound recordings being made from small, unobtrusive devices (please...no 10-foot high mic stands propped up in the middle of the crowd!) so long as the results are not offered up for sale at a later date. If you have any questions, please feel free to contact Lisa. We thank you for your understanding and look forward to seeing you on the tour! For more information on The Dresden Dolls, check out their website. Unfortunately, The Legendary Pink Dots have had to cancel their plans for a small tour of Scandinavia in early September as there were no prospects for shows in Oslo or Gothenburg. The Dots are trying to make new arrangements (possibly for shows in November), but unless they can find an interested venue in Gothenburg or Oslo, it is unlikely that they will be able to schedule any dates in Scandinavia in the near future. If anyone out there has specific contact information or ideas for Oslo or Gothenburg, please contact me as soon as possible...or go here and choose "Live Shows/Booking" from the drop-down menu. We are pleased to announce the dates and venues for Edward's US solo tour and the LPD shows in Russia! The obligatory disclaimer applies, of course. Please remember that dates and venues can (and most likely will!) change. I will update the news page here at LPD Online Centraal and TEKA with date and venue changes as well as official confirmations, so please keep checking back. Here are the dates for Edward's solo tour. Shows marked with a (C) are confirmed. Joining Edward on the US tour will be The Silverman, Nicoletta Stephanz, Raymond Steeg, and me! I'm very much looking forward to meeting all of you, so please, please, **please** say hello! Also, many thanks to all of you who have been passing along contact information for venues in Sweden! Your help is very much appreciated! More live shows are in the works and we'll keep you updated as dates and venues are confirmed! The Legendary Pink Dots are looking to book shows in Norway and Sweden. If anyone has information on venues that might be interested, please get in touch with Lisa or click here and choose "Live Shows/Booking" from the drop-down menu. More information about live shows is coming very soon, so keep checking this page. We have added a glorious version of "Grain Kings" to the Downloads section. The song was recorded at Stone Coast Brewery in Portland, Maine on 8/24/97. Joining Edward onstage at all of the shows in Germany are Phil Knight (The Silverman) and Nicoletta Stephanz (Coven of One). Sound wizard Raymond Steeg will work his magic from behind the mixing desk. Another show has been added to Edward's schedule. He will be performing at Universum on June 20th. You can see a flyer for the show here. Edward has secured another solo show in Germany. In addition to the scheduled shows at The Bunker on June 17th and The Cuba Club on June 18th, he'll be performing on June 16th at Immerhin. More confirmed dates are imminent, so please keep checking this site for live show updates. The press release for "Dream Cell" came through my in-box this morning. More details will be posted here as they emerge from Chez Dots. And your dreams just went up in smoke. To Dream you must not Sleep. The Dream Cell is your only hope. "Dream Cell" is the very first solo excursion by Philip Knight (aka Silverman), keyboardist and founding member of The Legendary Pink Dots. Recorded between Summer 1992 and Autumn 1994 in Nijmegen, the Netherlands, "Dream Cell" was first released on CD in 1995 by The Terminal Kaleidoscope. Eight years later we bring you this exquisite vinyl edition, complete with a bouquet of vibrant bonus tracks and the original cover art returned to its full glory. After many, many months of maintaining both legendarypinkdots.org and brainwashed.com/lpd, a decision has been made by me (Lisa), Edward, all at Chez Dots & Jon Whitney to consolidate these two websites. 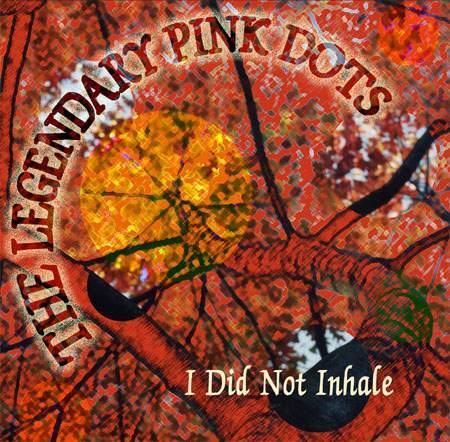 Pointing your browser to www.legendarypinkdots.org will now bring you directly to LPD Online Centraal. All lpd.org photo galleries and the monthly MP3 downloads have already been restored here at brainwashed. You'll find them on the menu bar to the left of this text. Next, we'll be revising and revamping the Dotsography to incorporate all those album cover images you've been missing for such a long time, MP3 samples of various songs, and the Cloud-Zero lyric archive. Many big changes are ahead as we renovate this website...so stay tuned! After Edward's appearance at the EE Tapes Festival on May 17th, it looks quite certain that there will be solo shows (including solo sets from The Silverman!) on June 17th at The Bunker in Cologne and June 18th at The Cuba Club in Munster. Edward is also trying to make arrangements for shows on June 19, 20, and 21st. This is where you all come in. If anyone has tips for West Germany, Belgium, or Holland, the information would be greatly appreciated. 1. Send Edward a private e-mail. 2. Click here and choose "Live Shows/Booking" from the drop-down menu. 3. Send Lisa a private e-mail. The latest LPD tour plans are for Poland/Russia/Scandinavia from 20th August - 7th September and the rest of Europe in late October/November. This website will be updated often as venues and dates are confirmed, so keep checking back. We have updated the Links page. The first edition of the Legendary Pink Newsletter ("Resurrection") was sent out on April 1. If you subscribed to the newsletter, but have not received your copy via e-mail, please contact me (Lisa). If you have not yet subscribed to the newsletter, but would like to receive a copy, you can sign up by clicking here and choosing "Subscribe to the LPD Newsletter" from the drop-down menu. Please note that you MUST enter your e-mail address correctly in the contact form in order to receive the newsletter.If you subscribed using a hotmail address, please check your hotmail filters. I have not received any notification of any of the newsletters sent to hotmail addresses bouncing, but have gotten some e-mails from people using hotmail who have not received their newsletter. Please get in touch with me as soon as you have checked your account for filters ( use this e-mail address ) and I'll send you the newsletter again straight away. The Legendary Pink Dots are now working with The Agency worldwide for concert and festival booking. We'd like to thank Paperclip Agency for their work on our behalf in Europe over the past few years. Edward Ka-Spel will be doing a live broadcast/musical performance for Radio Human (Radio 747) on Tuesday, March 25th. He will be joined by The Silverman and sound wizard Raymond Steeg. The program is scheduled from 2pm to 4pm at Theater Desmet in Amsterdam. On Tuesday March 25, 2003, at midnight sharp, Edward Ka-Spel will read from his recently published book "Love and Loud Colours" in Nieuwe Vide Centraal at Verwulft in Haarlem, The Netherlands. Universal citizen Ka-Spel is nothing less than a rock-shaman and singer/lyricist of the psychedelic collective Legendary Pink Dots for more than twenty years. The performance in Haarlem will be surrounded by veejaying and soundscapes. The entrance fee is 5 Euro, but because there are very limited tickets available, it is nessecary to make a reservation by e-mail to Martijn Lucas Smith. For more information - not for reservations - e-mail Peter Bruyn. This unique performance will feature both spoken word and improvised music. Again, Edward will be joined by The Silverman and Raymond Steeg. Word came from BCO camp (or tent...or cardboard box...) this morning that their latest venture "Moisture" is now available. According to BCO: "Moisture" is based on our 2001 trip to Europe. While Rob and Russ helped record the base tracks, the recordings here come from live recordings at the Zack Club in Bremen and Radio 100. in Amsterdam (the night of Sept 11th.) The remaining bits were taken from Phil (The Silverman), Nina and Das playing in our camper on the river banks in Nijmegen. The obligitory sound effects (tracks 8-27) consist of the channel ferry, a tesco in Northampton, and under a bridge in Nijmegen." You can listen to an MP3 sample and purchase "Moisture" here. Due to an increasing number of requests, we will be re-launching The Legendary Pink Newsletter this spring. If you would like to subscribe, you may do so by clicking here and choosing the appropriate subject line from the drop down menu. We will not automatically subscribe you to this mailing list without your permission (even if we know you personally and we know you would love to receive our updates! ), so if you are interested, please remember to take a moment and drop us a line. In 1999, Terminal Kaleidescope introduced the "Utopia" page to its newsletter. The aim of this section of our website is to pass on information about other worthwhile artists and actions in what could loosely be described as "The International Underground." We have updated Utopia as of March 5, 2003. You can find the latest additions (Ink and Hotel Encore) here. Long time LPD fans will recall Stephan Barbery's beautiful cover illustrations for Pink Dot releases such as "The Crushed Velvet Apocalypse" and "The Golden Age. The Legendary Pink FAQs have been updated by Edward, based on the most common inquiries turning up via e-mail correspondence. Please take a moment to read through them and see if your questions have been answered before you contact the band or the webmistress with general queries. The live shows originally slated for Italy and Greece in March are being postponed until later this year as schedules are juggled. Right now, the Dots are eyeing a potential mini-tour in May and are looking for venues in Sweden (particularly Stockholm), Norway, Finland, Denmark, Poland, and Scandinavia. If anyone can help the Dots with booking/venue information in these countries, please contact Edward. If you do not know how to contact Edward, please e-mail Lisa with the words "Club Info" in the subject line and your messages will be forwarded directly to the band. Photos from the festival in Paris on 28 January are online now at LegendaryPinkDots.org. There is also a nice version of "Stitching Time" from the Double Door in Chicago (Halloween 2002) here.